Flight Safety Foundation has published on its website a document by the industry’s Fatigue Countermeasures Working Group that details the best practices for implementation of a policy allowing for controlled rest (CR) on the flight deck. CR is defined by ICAO as a “short sleep opportunity” that serves as a mitigation strategy in case of unexpected fatigue during flight operations. It is not to be used as a planned strategy to extend duty periods but rather as a “safety net” to combat in-flight fatigue. 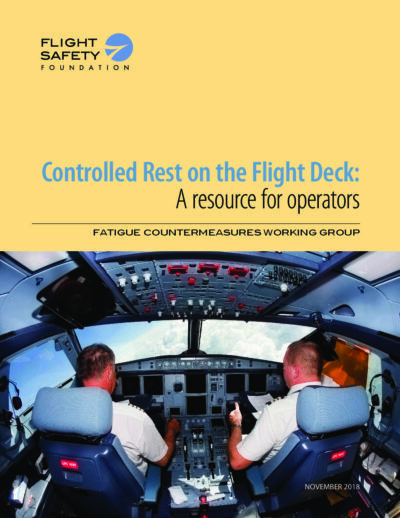 Although the first CR procedures were introduced by airlines more than 20 years ago, the document, Controlled Rest on the Flight Deck: A resource for operators, provides the first review ever conducted of the practice of CR, along with an overview of current scientific research on napping, sleep inertia (the feeling of grogginess that sometimes occurs after waking) and CR. Other sections of the document offer guidance for operators in deciding whether to introduce CR; how to implement, document and review an effective CR procedure; and how to monitor and continuously improve CR as part of a fatigue risk management program. An appendix contains the International Civil Aviation Organization’s recommended procedures for CR on the flight deck. Some regulators, including the U.S. Federal Aviation Administration, prohibit CR, the document noted. It added, however, that “the absence of a CR procedure does not prevent flight crew from napping, let alone from inadvertently falling asleep” and that concerns about CR “can be managed through an effective CR procedure, crew training and integration” of CR into effective fatigue risk management. The Fatigue Countermeasures Working Group is made up of fatigue safety managers from commercial air transport operators; representatives of pilot labor unions; and researchers and scientists from Clockwork Research, the National Aeronautics and Space Administration Ames Research Center, Washington State University, and independent research organizations specializing in fatigue and human performance.